American’s website has introduced two new airline partners for online award booking, oneworld airlines Finnair and Air Berlin. I do a lot of award searches, and this seems new today. Online booking is a real convenience to customers. I frequently talk to people who do not realize that there are award seats available that aren’t offered by an airline’s website — even though I find that most awards can’t be booked online. Delta has very few partners online. US Airways doesn’t have any. And even though United has virtually all airline partner award space bookable on its website, the site often shows phantom availability (especially with Lufthansa) and isn’t smart enough to think of all possible routes to get between an origin and a destination. So websites can’t be completely relied upon. But bringing more partners online means that more customers will see the seats that are being offered. It’s still imperfect. AA.com still supports fewer airlines than they do not support. And the website does have some pricing glitches — for instance if you need to use a multi-city search to piece together an itinerary (if you select flights one at a time when the website won’t give you the connecting options you want), it will often price the flights separately as well. For example, San Francisco – London – Nice will come up nicely if both segments are available in premium cabins, or if you’re looking for coach if both segments are available in back. But if San Francisco – London is available in First while London – Nice is available only in coach, I’ve run into problems where the website won’t return the flights. I’ve put the flights together using multi-city search, one segment at a time. When I do that it prices out on the website as US – Europe PLUS an intra-Europe award. A quick call to AAdvantage will fix that. (That’s hardly the only pricing glitch American has, they sometimes want to price out separate awards when you are including an allowable stopover at a North American international gateway city for instance). 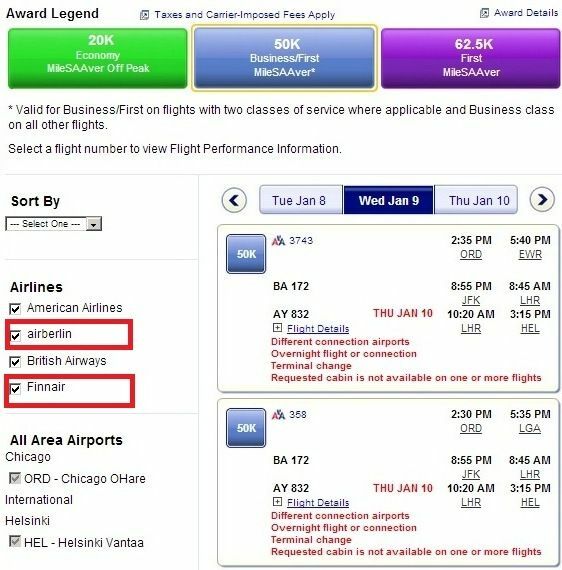 American’s Frequently Asked Questions page on partner award bookings has not yet been updated with the new functionality. It doesn’t yet list Finnair and Air Berlin amongst the partners supported for online booking at AA.com. Q. Can I redeem miles on AA.com for travel on AAdvantage participating airlines? A. Alaska Airlines, Alaska Airlines flights operated by Horizon Air or SkyWest, British Airways, British Airways operated by BA CityFlyer, Comair (LTD), Sun-Air of Scandinavia, Iberia (LHR to MAD flights only) Qantas Airways, Qantas operated flights by Jetconnect, Jetstar and QantasLink, and Hawaiian can be booked for award travel on AA.com. The project to add airlines is taking longer than I would expect, I think the last time one was added was Qantas back in June. But it’s certainly progress! Great, they have Europe covered now. I have a lot of finnair miles (though not enough to cover a r/t from US). Is there any way to utilize them across other airlines? I am trying to book and the system just goes around in circles with errors. @zz — Please DON’T add CX!! Once they do, it will become impossible to find any open F award seats. A positive step, but quite a few more to go to catch up to United, even for Europe. I had to call in and pay a fee to book Chicago to Madrid on Iberia just a few days ago. San Francisco – London – Nice will come up nicely.. Pun intended? I don’t think they display Hawaiian any more… at least not the JFK-HNL flight.